4 Pics 1 Word Concert. Heart line monitor. Girl punching with blue gloves. Dancing with stereo, radio, boom box. Find the 4 pics 1 word answers you need and still have fun with the game that has hooked millions of people. 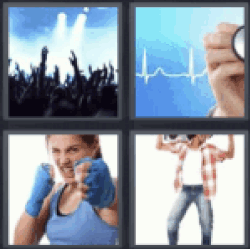 4 pics 1 word concert.